Age Match has been in the age gap match-making business for over 15 years and has successfully matched-up several singles on the platform. It has featured on CBS and your subscription will be processed through a secure platform. You can also read success stories of several users that have found love on this younger women older men dating site. The site has a very simple UI design, Ads free, and its layout is easy to navigate. All its tool tabs are easily accessible and you will find everything you need to know about the site on the homepage. What makes the site unique is the wealth of information and support available on the site to guide users to finding a perfect match and getting the best out of the site. If you do not want to go public on the site whenever you are online, you can hide your profile from other members as a paid member. It is free to sign-up on the site. At the point of registration, you will need to provide your first-name, username, password, email, age, ethnicity, relationship status, your gender and the gender you seek, country, and postal code. After this, you can build your profile and can upload about 26 photos. With your detailed profile, you can start surfing the list of available members or make searches. It has a quick search tool that can be used to find a match. You will need to specify your gender and the gender you seek, the age range, country, and state. With the advanced search tool, you will be able to efficiently narrow-down results and find interested members even by location. The let's meet feature is another quick way to get matches. To do this, you will browse through several photos of members and click your most preferred personality. The system will send a notification of your interest to the user. If the user accepts it, you will be matched-up immediately! It has a dedicated blog section where you can post your own blogs or read and comment on that of others. You can also read dating tips or join discussions in the "forum" section to make a post or to comment on available topics and interests. It is 3 categories: All, Popular, and Newest. With your free membership, you will be able to create a comprehensive profile, send unlimited winks, and receive messages from paid members. With your paid membership plan, you will be able to upload your photos, send and receive messages, use advanced search tool, send emails, chat, use more privacy options, and keep an eye on members who checked into your profile. You can choose from 3 options: 1 month, 3 months, and 6 months with several payment options including Paypal. Age Match is a platform for mature singles that do not see age as a barrier to seeking love from older persons. It has a huge and active user-base of singles seeking partners for age gap relationships and has more older men dating younger women. To give your profile a better quality and build trust, you may choose to get it "verified". To maintain quality service, the site charges members through subscription plans at $1 per day, and as a paid member, you will enjoy unlimited access to all features on the site. With several useful features and a comfortable environment, you will enjoy an interesting dating experience on this platform. 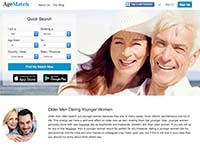 There are several user testimonials accessible from the success stories tab to encourage younger women looking for older men on the platform. If you need a partner living in the UK or US for an age gap relationship, you should check into this site!